Adjustable-width slots. Variable browning. 360° rotational base. Blaupunkt Marble Effect Kettle & Toaster. This kettle has a huge 1.7L capacity and matches with the equally stunning Marble Effect Toaster. Removable Crumb Tray. Matches with the equalling stunning Marble Effect Kettle. Full of handy features with high performance toaster. The Cream Breville Impressions VKJ956 Jug Kettle is a ridged textured designed and is sure to be the centre point on your kitchen work top space. Power: 1300W. The 1.7L Cordless Kettle features a large water level indicator window and an illuminated power on switch. Kettle Specifications Slide out washable filter. Colour: Black. Illuminated power on switch. Breville Curve. BREVILLE Curve VTT912 4-Slice Toaster - Grey, Defrost function, Warming function, Extra-wide slots, High-lift eject. 4 Slice Toaster 7 Kettle Set. Toaster (VTT912). Eye-catching on any kitchen countertop, the BrevilleCurve VTT911 4-Slice Toaster is both stylish and functional. Full of handy features with high performance toaster. Left hander?. No problem, this Jug Kettle is designed for everyone with its pivot 360 degree base making pouring water easy and safe for all users. 1X Wide Slice / Bagel Toaster. 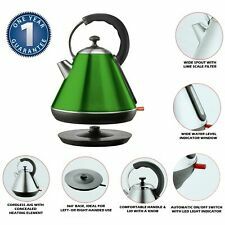 1X 1.8L Electric Cordless Kettle &. Legacy Electric Kettle. Wide-Slot / Bagel Toaster. -Six toasting levels, from lightly toasted to well done. -An elegant solution to your water boiling needs. This is noticeable by the shape and position of the handle, which will optimize your comfort when holding the kettle. It can be used by left or right handed users. This is made possible by the kettle swivel base, which allows the kettle jug to turn 360 degrees. Water Gauge. Dry Boil cut-off protection. Automatic Cut-off. 360 Degree Base. The 1.7 Litre 2200W Fast Boil Blue LED Illuminated Electric Cordless Glass Jug Kettle from Voche® has a modern, stylish design with a stylish blue LED illuminated feature. It has a lift-off lid for easy filling and boil dry protection for safety. It’s not just about looks though, both appliances also have a range of clever features that are designed to make your daily routine easier than ever. As well as its stylish appearance, this is a toaster that boasts a range of features that make getting that perfect slice easier than ever. This 1.7 Litre 2200W Ultra Fast BoilDual Illumination Electric Cordless Glass Jug Kettle from Voche® has a modern, stylish design with a dual illumination feature, it lights up red when it is boiling and blue when it has boiled and is off! The removable crumb tray makes it easy for you to keep your toaster clean and tidy. By being able to see the exact quantity of water in your kettle, you only boil what you need. Removeable Crumb Tray. Full of handy features with high performance toaster. The Black Breville Impressions VKJ755 Jug Kettle is a ridged textured designed and is sure to be the centre point on your kitchen work top space. Breville Impressions Kettle and Toaster Set - Cream. Breville VKJ956 Impressions Kettle - Cream. Non slip feet make the kettle more stable on your worktop and the 360 degree base makes it easy to use for left and right handed people. 1.7 L capacity kettle with 3 kW rapid boil. Breville Curve. BREVILLE Curve VTT914 4-Slice Toaster - Red, Defrost function, Warming function, Extra-wide slots, High-lift eject. Box contents: Breville Curve VKT019 Jug Kettle- Instruction booklet. Salter Rose Gold Edition 850W 2 Slice Toaster EK2652RG. Featuring a striking matte black base with elegant rose gold accents this kettle will improve the look of any kitchen. Salter Rose Gold Edition 1.7 Litre 3000W Pyramid Kettle EK2649RG. 4 Slice Toaster And Kettle Copper Effect. This gorgeous copper 4 slice toaster and kettle set will add a touch of nostalgia to your kitchen. Toaster Specs. Kettle Specs. Depth 29cm. Depth - 24cm. Power - 1580, 1800W. This gorgeous copper-effect 4 slice toaster will add a touch of nostalgia to your kitchen. Fashionable 4 Slice Toaster Copper Effect. Copper Effect Kettle. Its stainless steel construction is finished with a copper effect design, providing a kitchen essential you'll want to proudly display on your worktop. Features Of Kettle : 2200w, 1.7 Litre, washable filter, Dual water level indicator window. 1.7 Litre Cordless Jug Kettle and 2 Slice Toaster Set. Toaster - easy removable crumb tray. Colour Black Condition New modern design Ideal Kettle and Toaster Set At Outstanding Prise. Berlinger Haus Kettle & Toaster Bundle, Rose Gold Line. Full year Manufacturer's warranty on the kettle and toaster. Toaster Features Under Toaster Cord Storage. Kettle Features Cordless Jug. Save £7 with this bundle. FREE DELIVERY, 2 YEARS MANUFACTURERS DEGREE! 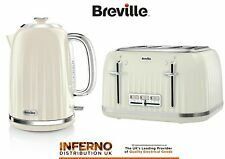 Breville IKJ989 ITT913 Outline Polished St Steel Jug Kettle 4 Slot Toaster Set. Side water window makes accurate filling easy, and illuminates blue on boil. 360 degree base for left and right handed use. Tower T10020WMRG 3KW 1.7L S/Steel Kettle White Marble/Rose Gold. Tower T20017WMRG 4 Slice S/Steel 1630W Toaster, Rose Gold and Marble. Designed with our contemporary white marble exterior coating, featuring a unique rose gold temperature dial and boiling switch, for a stylish finish on your worktop. • Fast boil technology. • Automatic switch off. We promote a 'repair not replace' culture instead of a 'throwaway society'. • 360° Swivel base. Unit 5B, Drum Industrial Estate. Channel Islands: GE-JE. Delonghi Icona Kettle 4-Slice Toaster Breakfast Bundle. The DeLonghi Icona Collection is a suite of stylish kitchen essentials that evokes the essence of 1950's la dolce vita. used : in excellent good working condition the kettle as 1 small chip on the paint hardly noticeable. Removable crumb tray / Cool touch walls / 800W. 4indoors provides a standard one year warranty on all of our products. This will need to be set up directly with the manufacturer. Details of this will be enclosed with the item. 4 Slice Toaster Microwave 20L 1.7L Pyramid KettleKitchen Set. 220-240V ~ 50Hz 2550-3000W. 4 Slice Toaster. Its stainless steel construction is finished with a copper effect design, providing a kitchen essential you'll want to proudly display on your worktop. 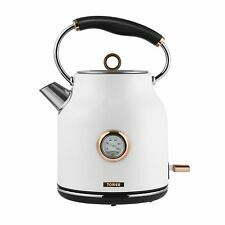 The Cream Breville Impressions VKJ956 Jug Kettle is a ridged textured designed and is sure to be the centre point on your kitchen work top space. Why not complete the look with the matching Cream Impressions VTT702 Toaster?. Boil dry protection automatically switches off when the kettle is empty. 360 degree base.A thing of beauty, the Westminster, red stainless steel kettle is designed with you in mind. With cord storage in the base you can now keep your surfaces cleaner and clutter-free. Full of handy features with high performance toaster. The White Breville Impressions VKJ738 Jug Kettle is a ridged textured designed and is sure to be the centre point on your kitchen work top space. 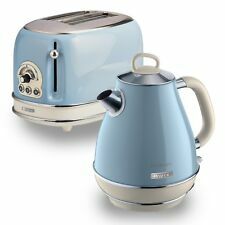 1.7 Litre Jug Kettle & 4 Slice Toaster. Boil dry protection - automatically switches off when the kettle is empty. 1.7 litre capacity. Rapid boil. Pull off lid. 360 degree base. White illumination on boiling. Full working couple of months old Morphy Richards Black Accents Rose Gold 1.5L Pyramid Kettle and 4 Slice Toaster. Condition is Used. Dispatched with Royal Mail 2nd Class. Brought in December last year (2018) comes with a 2 year warranty from Currys, comes with receipt and boxes. selling due to redecorated kitchen and wanted different colour appliances. Both items retail price at £45 each On 07-Apr-19 at 18:40:11 BST, seller added the following information: Used applicants one scratch on the side of the toaster. By combining a black premium textured high gloss finish with stunning stainless steel accents; this kettle will add a touch of class to any kitchen counter. Inspire Black Kettle. Inspire Black Toaster. Breville Jug Kettle - 1.7 L Polished Stainless Steel. Breville 2 Slice Warburtons Toaster - Polished Stainless Steel. Toast to the Top! Specially designed to be The Perfect Fit for Warburtons, this Breville VTT570 2 Slice Toaster reaches new heights in toasting. Tefal 4 slice black toaster and kettle set. A kettle and toaster set can provide you with tea and your choice of hot foods for a satisfying breakfast each morning or a proper snack at any time. 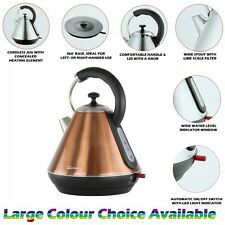 You will find combinations of toasters and kettles in a variety of colours and styles on eBay. Understanding what options you can choose for your kettle and toaster will help you find the set that suits your preferences. Do kettle and toaster sets come in different materials? Plastic: A plastic kettle and toaster set may be available in a wide range of fun colours. These items are typically lightweight and easy to use. Metal: Most metal kettle and toaster sets come in stainless steel. The steel is durable, and its stainless properties make it resistant to corrosion over time. Can you choose a power level? What are some features of a kettle and toaster set? Gloss: You can choose a set that has a glossy sheen that reflects the light. A high-gloss kettle and toaster set may have a sleek appearance. Cordless: The kettle part of your set can be cordless, allowing you to take it with you for serving or pouring.